This simple box realizes the common sample rate reduction effect in analog form. Sample rate reduction is essentially very low quality analog to digital conversion. A snapshot of the input signal is taken every so often and outputted. The effect comes in when the frequency of snapshots is at an audio frequency. The resulting sound is a lot like a ring modulator. This box is sort of a little brother to the Digital Lo-Fi Box. The sole knob controls the sampling frequency - no frills here! A sound clip can be heard here, or more information including pics can be found on the EA website. I do get some very high pitch oscillation on the sweet spots of the pot's turn. It changes throughout the sweep. Could be that this is present in the demo as well.. You'll only hear it when you're not playing. Excellent, cheers matey. So do the pot lugs need swapping? Yup. If the demo is from CCW to CW and back. Verified. Just finished this build. I did find using 2 TL072 only gave a clean signal. I used 1 TL072 and 1 NE5532 and it worked great. I used the 2N5457 for trans. Gives a ring mod, metallic and 8 bit sounds for sure. Totally no effect fully CCW and then lower freq as you turn CW. Unfortunately the only problem is the constant "whine" sound. It is faint, but there and totally in tune with the frequency. Higher to lower pitch. It the background whine could be eliminated this thing would be great. The 1 M pot is probably overkill as most sounds past half way are not very useable or musical. Probably a 250 to 500 K pot is best. Thanks for the info bigrigg. There are a few conversations going on at the moment about improving the circuit so I'll do a revised layout when that has some conclusion. My pleasure and I look forward to the revised and hopefully quiet versions etc. I thank you greatly for all the amazing projects you offer. This will not be my last. Take care. I've just finished this and I had the same issue with two TL072s that Bigrigg had, thanks for the heads up about the NE5532 Bigrigg, it worked a treat! I had to use the NE5532 for the top IC on the layout and the TL072 for the bottom one otherwise it didn't seem to work. To be honest the circuit seems a little temperamental, I'm using a 2.2M log pot and all the bit crushing appears to be happening over only two thirds of the pot, past that and the sound goes back to normal. It does give a nice 8 bit sound though, I've built it as a DJ effect for a friend and if anything it's probably better suited to that than guitars. This circuit seems a little temperamental but it's always noisy. I went through a bunch of TL072's and most worked fine. There was just an occasional opamp that didn't work. The high pitch always leaks through, even when it's bypassed. If this can be fixed, I would love to make more of them! First I used a 1M pot, then a 250k which still was too much. I reckon even a 100k pot would suffice. I threw this one together, just for the hell of it. I had to use NE5532 for the top IC, as well. The pot(1meg) travel is a bit weird as well. There's a portion of it that goes really quiet. If I play hard there's still sound coming through. I did try a different pot with the same occurrence. Oh well, probably never box it up. Just for shits 'n' giggles, I might try it after the Clari(not)!! I Just built this for the fun of it and I am really liking it. Any developments on quieting the whine? Ground the output. Use the extra pin of 3PDT switch you use for bypass. I thought I had grounded the output but it is still whining even in bypass. :/ I have the 3pdt wired just like the offboard page shows it. 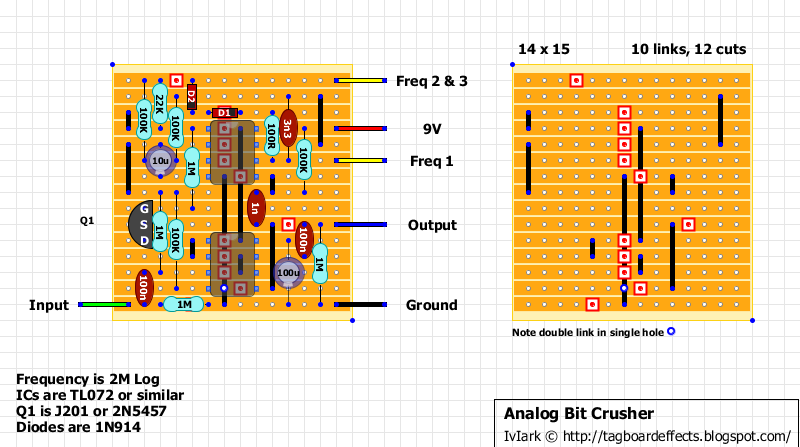 So how would I go about grounding the output? you said use the extra pin you use for bypass but every pin on the 3pdt is being used. Sorry I know its a kind of a dumb question but I do appreciate the help so very much. I got nothing but the whine with the NE5532/TL072 combo and straight audio signal with 2 TL072s. Two NE5532s produced even more whine. I tried both 100k lin and 250k log pots, but couldn't get past the whine. I'm almost certain that it's missing something though because at first I thought I had a grounding issue. It was really sensitive to movement (jiggling), but totally unpredictable. Seemingly a momentary 9v/ground bump would start what I thought was the proper oscillation and then grounding filter 1 (or 2-3 I dont remember) wire would knock it back to a clean signal. This is my first build that I'm not smart enough to troubleshoot. hi, did you resolve your problem? I'm having something similar with my build. I had a similar problem, I think the circuit might just be picky with the NE5532. The combination I ended up going with was a TL072 on top and a TL062 on bottom, but more to the point, I think everyone's circuit is just going to be a unique snowflake depending on how the tolerances sway on your components. As to stability, yeah I noticed that, too. Like, if I pick up the board and move it, rotate it, it gets all weird. It's even temperamental about having 9v exactly, or slightly less, or slightly more. Just a weird weird weird circuit. Hi, possibly a stupid newbie question as I'm just starting to build pedals and learn to read schematics. But what are the parts called '3n3' and '100R' stand for on the schematic above? Hi, I just build this (finally had time), but I only get a clean signal. I used 250K log pot and both IC's are TL072 (haven't got the other IC as suggested above). Should I get a different IC or is there a workaround to get some (hopefully) dirty 8bit sound out of it? So, again: I'm only getting a clean signal. I tried some different pots (log, lin, reversed) with same results (clean signal). IC2 voltages are not looking healthy. Both ICs have their pin number 8 connected to each other with a link, and you're getting 0,4V at the lower IC's pin 8 - where you should have the same supply voltage as for IC1's pin 8. Plus the IC2 pins 6 & 7 are also connected via the link under the IC, so those should also have the same voltage on both pins. Are those links ok? But the other ones are wrong so I will have a look at that. More info soon! Quick question: IC1 is the IC starting on row 4 from above. IC2 is the one close to the input/ground row, right? So in my previous comment IC below is IC 2; which is having the same values on pins 6 & 7 (both 4,7V). Or do you mean that IC1 pin 6&7 should also be the same? (which are 8,3V & 1,3V on my board). Since it was my mistake, now i'm not so sure about anything. But since you're getting a clean signal through, that menans that the issue is either with the JFET or the clock oscillator (upper IC). Have you tried to swap that JFET? what would be a good JFET and/or to swap with? I meant if you used a socket for the FET, you could try another J201 if that would cure it. I'm not exactly sure what the voltages should read on the upper opamp, but it seems like TL072 won't work as a clock. So do you have any other dual opamps you could try in its place? 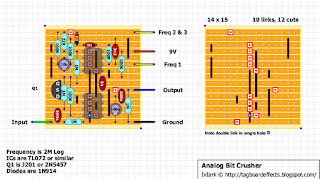 For the latter question - most of the dual opamps are pin-to-pin compatible. The ones you could try here are TL062, TL082, JRC4558, JRC4580, OP275, AD712. For the JFET, any N-Channel JFET with the same pinout should work - like 2N5457, 2N5458, J112 and so on. The best way to see if the pinout is the same for two different devices is to check the datasheets. You're choice on search engine will probably offer the datasheet as a first hit when you search for the component model. Anyway. Now that i finally got around to read all the other comments, i'm pretty sure the issue you're having is due to having TL072 as the upper IC. Just checked the earlier comments and i'm pretty sure the issue is that TL072 doesn't work for the clock. So discard my thought of swapping the FET. You could try any other dual opamp for the upper IC. For example, JRC4558, LM358, LM1458 or the one that reportedly works - the NE5532. Most dual opamps are pin-to-pin equivalent, so all the usual ones used on many pedals are interchangeable. By the usual ones i mean the likes of JRC4558/NJM4558/KIA4558, JRC4580, TL072, TL062, TL082, TL022, AD712, OP275, NE5532, LM1458, LM358 and so on. You can always check the pinout and other specs by searching the internet for the part name. That'll usually give the datasheet as a first hit. thanks for the great replies. This is very helpfull and I'm going to test some out. Ordered a few, so still waiting for those. But I'll try with what I have in stock! Thanks!! hi, I tried some and now have a setup produces 'noise'. But not yet in a good way. Without any guitar input there is a constant beep/ loud constant oscillation (sinewave, how should I call it?) frequency. It changes when the pot is turned (when completely open (clockwise) there is a clean signal. The setup right now is with 2N5457, lower IC: JRC4580, upper ic: CHN4558 (didn't have any other). Could it be the pot or should I order some of the IC's mentioned earlier to try out? mmm, maybe I will try that too! OKwilliam, did you ever get this working? I have no sound at all, so would love to know what the working voltages are. thanks. Is there a definite fix for the whine? I built this the other week according to the layout above and it works but the whine is almost as loud as the wet signal. Hi! i built this one, and it works only when i touch pin 3 of the upper IC, and then it seems to be working perfectly. any thoughts? i'm a bit lost... thanks! "I had to change R7 to 220K to get any output from the oscilator and I had to lower R4 to about 500k to get the J201 to switch, but I've only tried one J201 so it might be a case of trying some more to get one that will work with a bigger resistor. "The bleedthrough is pretty low, there's a bit coming from the oscilator but most of it comes from the jfet switching. "I tried the inverting opamp idea with pre boost/post cut and using a gain of +-20 lowered the bleedthrough a lot. "I also wonder whether it might be worth decoupling the jfet like in RG's stutter pedal, because at the moment the second opamp is getting its Vb voltage from the output of the first one. I think this means that when the jfet is off the opamp's momentarily unbiased which might be adding to the noise. Decoupling would also let you try the jfet as a shunt to ground switch instead which is sometimes less noisy. "Cool circuit though, definately worth playing with." I have made R7 variable with a trim pot and now I can tune in the point where it starts oscillating - it is slightly below 100K. Tried several Opamps and several transistors. But I always get that nasty whine. Dialing in R7 and the Freq Pot I even got a radio station - some American AM oldies station of all things. Changing the value of C4 only changes the pitch of the whine. I'll try decoupling the FET with a diode next. ....but that did not work either. Hi, I'd like to make this pedal, but I little bit noon. In the schematic see squares with red borders and red central points too, what does it mean? And what is vb? Thanks! This is where you need to cut / interrupt the copper traces on the back side of the strip board. Best way is to take a 6mm drill bit between your fingers, place the tip into the hole and rotate carefully until the copper around the hole is gone and the track is completely interrupted. Hold against a light source to verify. Very useful your information. Thank you! Built it with an NE5532 for the top IC and an OP275 for the bottom, the quietest combo I could find. A B500k works nicely too. Any idea on how to boost the signal a bit? It's just a shade below unity gain. Hi! Guys, can some one share the schematic please? Thanks! How to fix that constant whine sound? Please. so is the pedal whining in bypass? is that the problem? or is it problematic whining while engaged? Thanks for the info, I'll have a look at it. Though I prefer to fail at my own soldering attempts instead of ruining someone's PCB. I did both, Bit Crusher and Sonic Reducer. The Sonic Reducer is the best, but not so far with a little improvement for the Bit Crusher. And you know what ? You have just to underpower it ! I just made a voltage converter, and feed it with 6V. It works a waaaayyyyyyyyyy better ! Test it in your effect-loop ! I've tried numerous combinations of ICs, and have checked for any short circuits and I can't find any. from what I gather the high voltages from pin 1/6 of the top IC are preventing the JFET from switching, but I maybe wrong. What would cause these difference in voltages and how could I correct them? Can someone tell me what the orientation of TL072 is? If you look closely, you can see the lighter detends on both. And usually all IC's are "top up". i want to put this in a PCB so i drew a schematic from the picture and i dont know if this is correctly assembly. im just starting at this, i need some help please! I had the same problems with the 2x TL072 sometimes producing clean audio. Got the pedal to function correctly by installing a 104 MLCC between 9V and Freq 2&3. It works every time now. I'm going to get a 7806 and try under powering it, to see if I can clean up that whine sound. Looking at the vero layout above, which 100k resistor did you change to 68k? Which pin of which IC? Thx! Built according to plan, with component values as listed above except for the pot (went with a 500k Log instead of 2M), and it worked fine. This is only the second pedal I've built using plans I've found here, and I still don't feel all that confident that things will work as expected from the get go once finished... so it was nice that there were no exploding components or abject silence once it was done and time to test out.